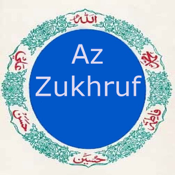 This application consists of Surah Az-Zukhruf from the Holy Quran in Arabic, its translation and transliteration in English. This surah was revealed in Makkah and it has 89 ayaat. ★ It is narrated from Imam Ja'far as-Sadiq (a.s.) that whoever recites this surah will be saved from the vermin (e.g. insects, scorpions etc.) in the grave and will not undergo the squeezing (Fishar) in the grave. ★ The Holy Prophet (s.a.w.) said that drinking water in which this surah was dissolved acts as a cure and a relief from pain.